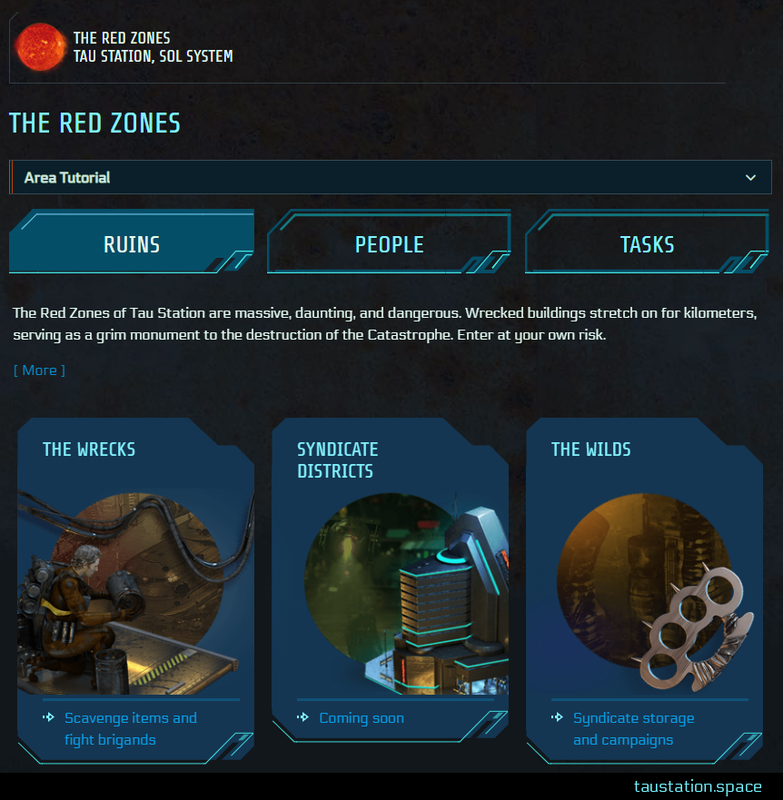 Enter the Wilds: Syndicate Campaigns! The game update of 31st December 2018 introduced the first big part of our new co-op feature. 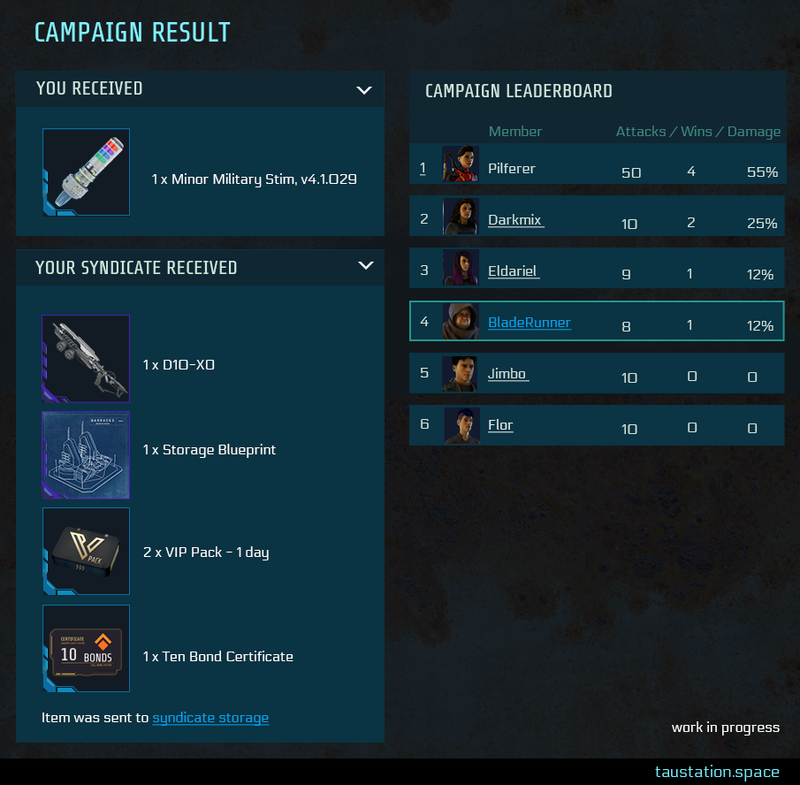 Time limited Syndicate Campaigns can be started in The Wilds by members with the ‘Campaign Management’ role. They have the power to initiate the team event, setting up details like enemy tier and difficulty levels. Enemy tier options depend on what your own members have. 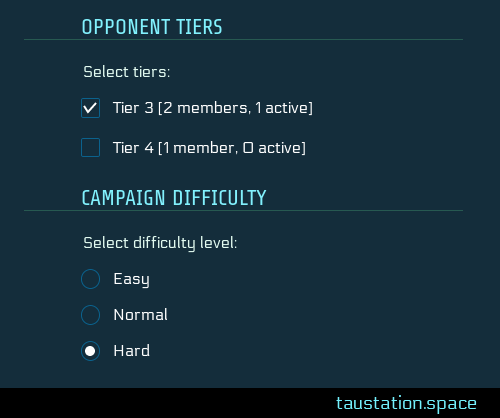 To help you make wise decisions, the number of recently active members (in the last tenspan) per tier is listed. Your Syndicate’s level is also relevant in this context, because it unlocks access to higher difficulties. An example set-up screen. This syndicate has unlocked 3 difficulty levels already. Every campaign contains several waves of opponents who tend to become more and more challenging. The display of recent team member actions helps to identify active companions, because team work is crucial. Stronger opponents might need more than one attack and, because enemies recover over time like you do, your team will need to take down stronger NPCs with a well-timed series of fights. Once your team succeeds and finishes a campaign in time, the results show not only some member stats, but more importantly, the rewards! The future internal leaderboard will show how often each campaign participant attacked enemies and how many opponents were defeated in a fight. 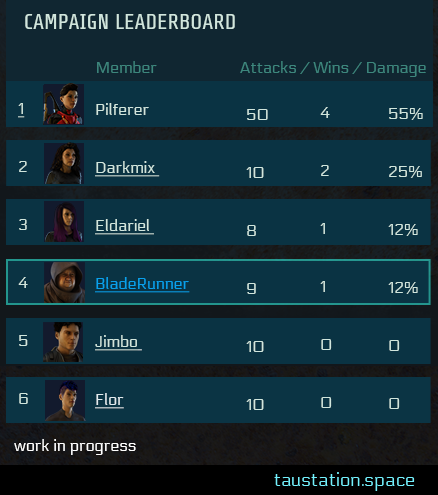 This (current) example campaign leaderboard reveals that 6 team members joined the co-op event. The bulk of the final rewards (like gear) go to the team, but every participant gets an individual reward as well. 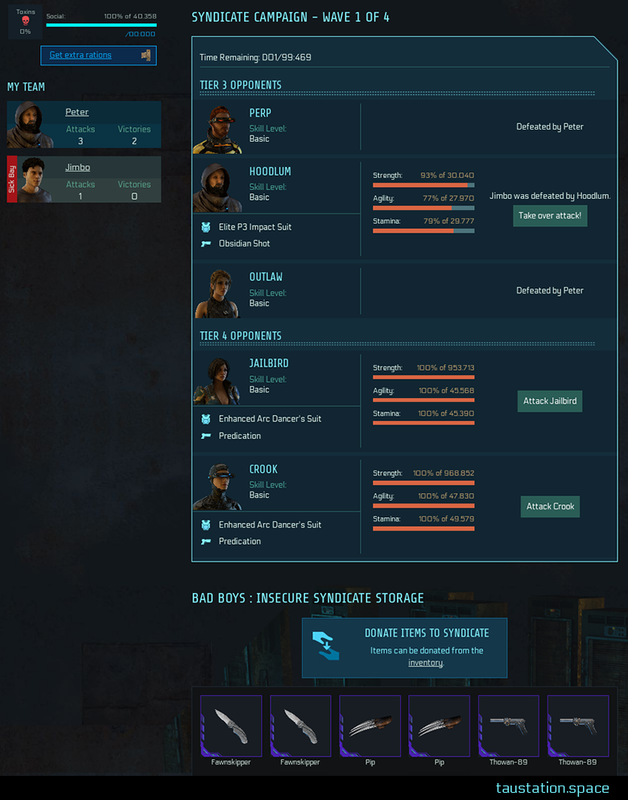 As always, items can be re-distributed to members via the syndicate storage, but it’s a matter of internal agreement how your syndicate shares or saves the loot. Good organization is recommended, as the more members taking action in the co-op campaign, the easier it will be to succeed. On top, every active fighter receives up to 4 military stims. The amount is based on the campaign’s difficulty. The maximum tier of your consumables is determined by your personal tier to ensure you can use the stim(s), but it also depends on your enemies’ tier levels, defined in the setup phase. Long story short: the more challenging a campaign is and the more active you are, the better the outcome. 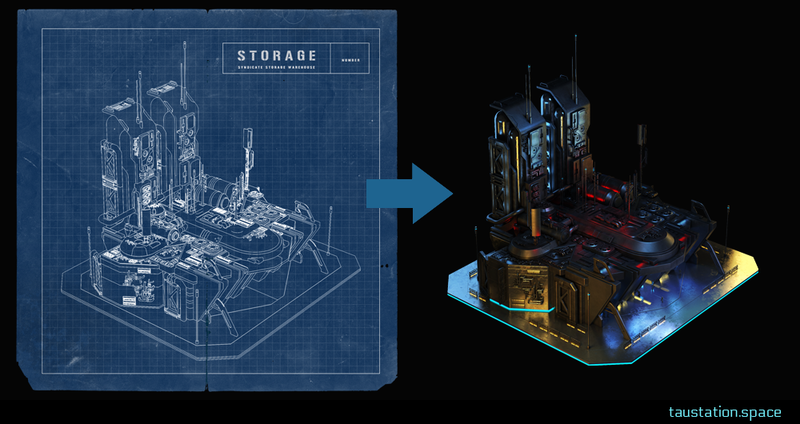 Blue Prints are brand new items, needed for the construction of the upcoming syndicate buildings in the Syndicate District area which we mentioned earlier in December and in the special article ‘Syndicates: A glimpse into the future‘. All teams can already prepare themselves for the upcoming feature, because there is already a drop chance for the first blueprint. The item will give the permission to build a secure syndicate storage! Again, the basic rule is – the more challenging the campaign and the more members join actively, the higher the chance of finding such a rare blueprint. There is no limit for blueprint possession; each team can find them multiple times. The rare plans can either be traded or your syndicate might want to use them for expansion by creating further buildings on other stations. Blueprints are needed to construct the particular building (in the future). Success can lead to very special epic item drops which can only be obtained in syndicate campaigns. So far, there are already around 50 of these powerful weapons and armor. Some of them deal all kinds of damage types, while others protect against all kinds. Tip: as you can imagine, the acquisition of such powerful items requires defeating strong opponents, meaning at least hard difficulty and the highest enemy tier possible. The more enemies you defeat and the higher their tier, the better the loot could be. 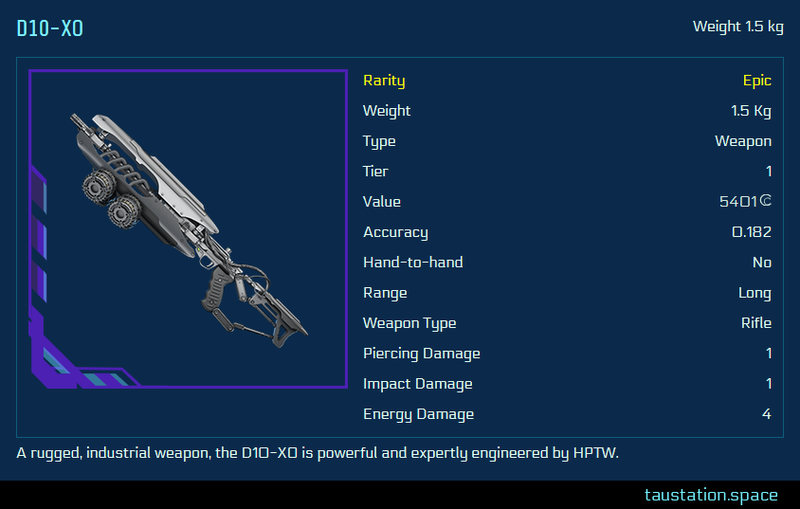 The ‘D10-XO’ is one of the outstanding epic weapons dealing piercing, impact and energy damage. 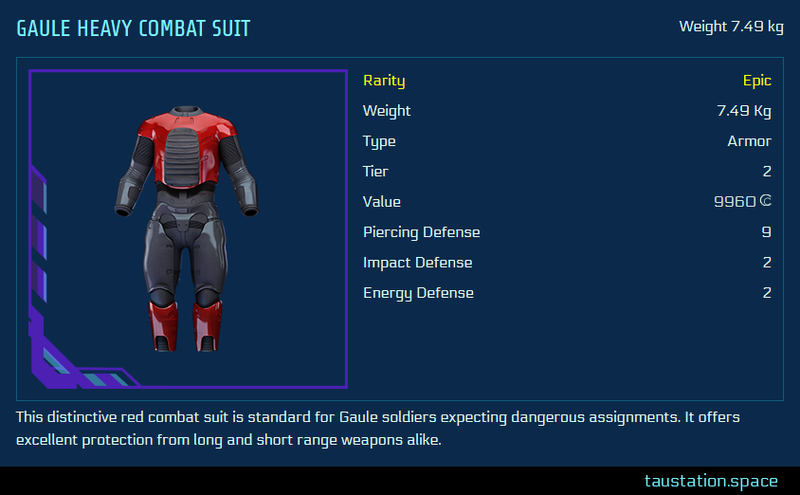 The ‘Gaule Heavy Combat Suit’ is a tier 2 example of epic armor with protection against all 3 damage types. 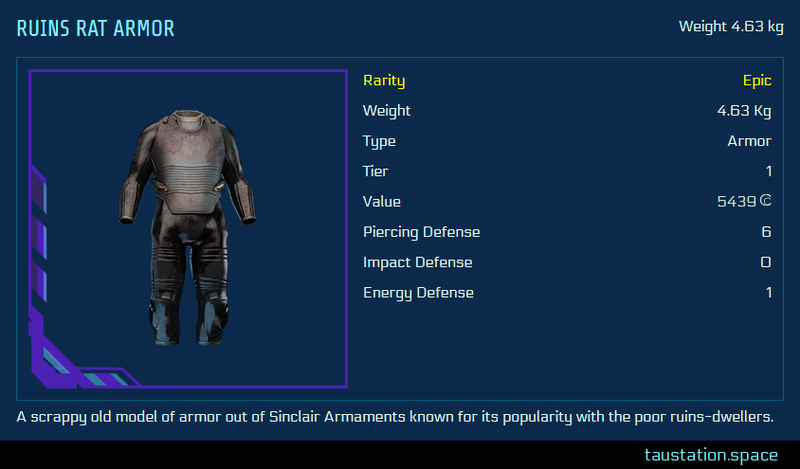 The ‘Ruins Rat Armor’ is another special epic item, having protection against 2 damage types. Your team also has a chance to find bond certificates. This item type needs to be ‘cashed in’ to add the bonds to either your syndicates’ bank or even to the personal bank account of a member. 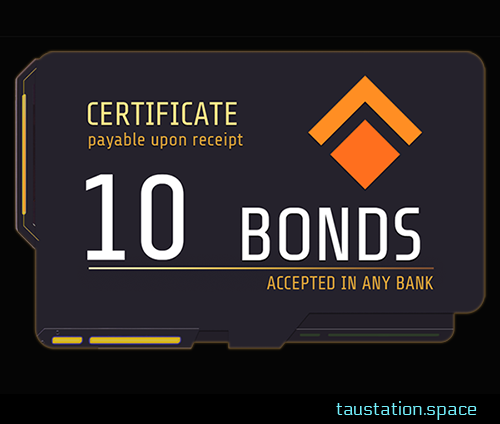 A bond certificate with 10 bonds in this case. Completing a campaign leads to station-specific item drops. As you can imagine, the tier level of a station might have an impact on the expected gear. Furthermore, the more difficult the campaign, the more likely you are to get rarer items. In case your team masters an extreme campaign, you won’t see common items anymore, but gear of higher rarities! The number of enemies defeated has a general positive impact on the amount of weapons and armor that can be found at the end. Further loot for the team can be rations, stims or 1 day VIP packs. All station characteristics have an impact on what you can expect. Exploring the universe further over time makes sense, because starting campaigns on stations with higher levels has an impact on the items you get. Further loot for your team. 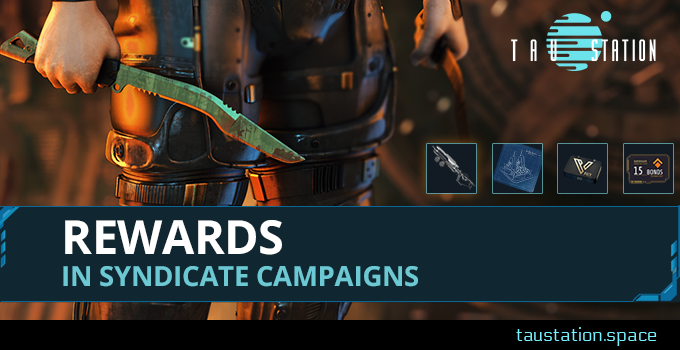 These first spotlights on the current status of campaign rewards should help to better understand how crucial good organization and planning is for succeeding in the new co-op campaigns. Activity pays off: for every member individually, but especially for the team that is able to support and equip the members with powerful gear. The rule of thumb about rewards is: the harder a campaign and the more enemies your team defeats, the better the rewards tend to be and, with some luck, you’ll even find a rare blueprint. The syndicate campaigns are only just beginning! There’s more to come, so buckle up for more thrilling features and extensions (like buildings) in the future. See you in space!